I thought I would share my latest knitting progress, in this case, the Prepster Sweater from The Yarn Girls’ Guide to Knitting for Babies and Toddlers. Since Amelia will soon size out of the cute patterns in this book, I decided to eke one more usage out before I shelve the book for future baby gifts. I have knitted several other items from this book and I love the simple but attractive patterns. The instructions are easy to follow and many of them are bulky yarns, which make for quick projects. This sweater is a plain, V-neck with ribbing on the bottom and the cuffs. 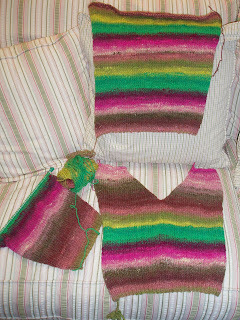 It uses Noro Kureyon in color 175. I love, love, love this yarn. I have finished the front and back and almost done with the first sleeve. As it is now in the 70s during the day here, she may not get to wear this before next fall. However, she is now keenly aware when I am knitting something for her. She comes by and asks, “Are you knitting me a sweater, Mommy?” I tell her yes. She says, “Oh, thank you, Mommy!” Wow. Although I am sad that Amelia will not get to wear all of the cute sweaters and hats in this book, I am grateful that the Yarn Girls have come out with another book (which I already own), The Yarn Girls’ Guide to Older Kids. Yay!